Hello! I have been here on Jemsite for many years, lurking, ad posting...now I am finally a Vendor!!! So I can post pics of my finished and in progress works! Come check out my banner above to see more of my work (I'm always adding when I get the chance). I have recently been commissioned by Barclays Center in Brooklyn to do some guitars. When they have artists play their venue, they give them a gift as a thank you...their PR person thought some custom painted guitars would be a good fit for certain artists. So I have been fortunate to do some for Pearl Jam, Pink, and John Mayer! I share shop space with Perle Guitars - so even more beneficial for those of you buying from him needing a paint job! No additional place to ship your stuff - he can just hand it over to me! 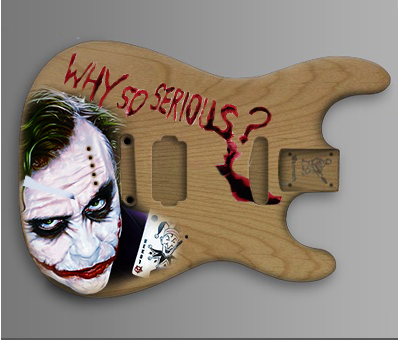 "LiQuiD Fx Custom Paint is your source for Custom Guitar Paint! We can take your old beat up guitar and refinish it to look new - or we can take one of our custom guitars and give you new - at an affordable price! We use only the finest custom paint products on the market to give you the best guitar finishing possible. We can do custom airbrushing,simple solids, color-change, swirls, holoflash, neons - you name it - we can make it happen. 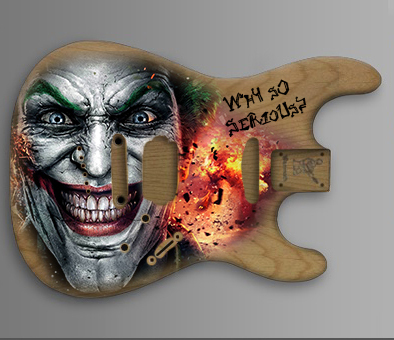 Custom paint jobs are our specialty focusing only on guitar finishes." Feedback 150% Welcome on my site, finished works, etc! Guitar for John Mayer - Barclay wanted sometime similar to his custom Fender model with his most famous lyrics and song titles on it...the result was this. A P540II I did several years ago - I think a member from here??? SeaFoam Green. These were his pics after it was put back together. Beautiful Natural Finish on some Ash. I call this "Cosmic Swirl" - Already sold - DNA neck with matching colors being built as well. This will be a full build for this customer, electronics and all. Hey, welcome. Nice to see you legit. You'd think they'd get your banner up though. Did you write Alan about it? The banner seems to come and go. I have emailed the person I was dealing with for all of it - not Alan though. Today's project in the shop : Jem in Neon Orange and a Nagle Print!!!! Stay Tuned! Thanks! It's getting a matching DNA neck with the purple and blue stands...as well as a matching headstock. Customer wants me to build the entire thing...thoughts on hardware color? Was even thinking of going with colored strings. Ideas??? If I use your idea (1st one to post it) I'll give you 10% off your first time services with me! Chrome hardware will pop, and coloured strings for sure. I'd go red and blue, since those colours make purple. Colored strings look awesome for pictures, but they sound really awful if they are the DR ones. I had some on a guitar and it definitely impacted the sound negatively.